Safeguard pasture rotation ARGT nematode resistant annual ryegrass shows considerable promise in overcoming ARGT problems throughout the cropping and livestock areas where Wimmera ryegrass is a problem . Safeguard is also resistant to Cereal cyst nematode and shows tolerance to Wheat and Oat strains of take all. In addition Safeguard will reduce the level of ARGT, (Anguina funesta), nematodes in oaten export hay. Safeguard developed through a joint program by Meat Research Corporation and the South Australian Research and Development Institute (SARDI), represents a considerable break through in assisting farmers to overcome ARGT by crossing with the background Wimmera thus incorporating nematode resistance into the following years population. With the added benefit of very good winter and spring production for grazing, silage or later hay, Safeguard can offer a very good pasture option for farmers in those drier areas affected with ARGT. 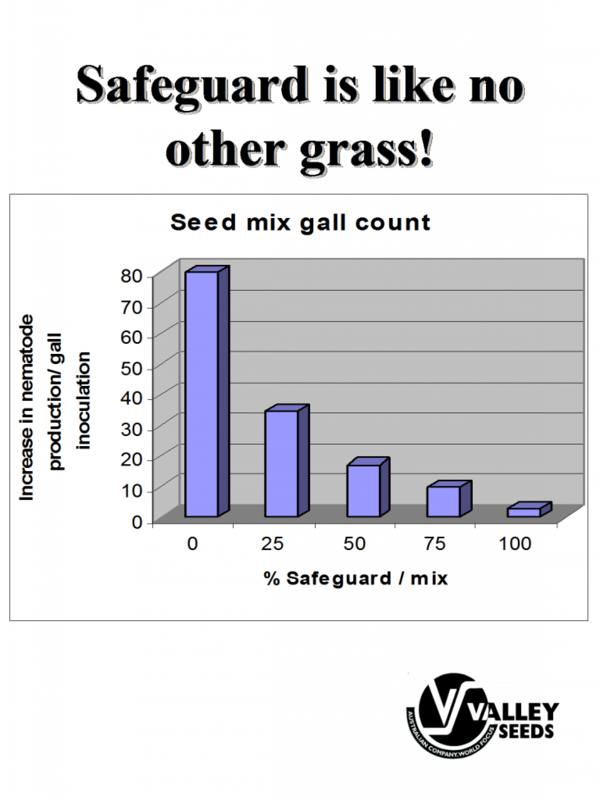 Safeguard is best sown into areas with less than 20 plants per m/sq of Wimmera sown before the break to ensure flowering will coincide with the resident Wimmera population in the spring. The graph shows the comparison between a pasture that has a high level of Safeguard achieving a high level of inoculation, and a pasture containing a high level of Wimmera where a low level of inoculation is achieved in the following progeny. This illustrates the importance of sowing the optimum seeding rate of Safeguard to achieve a high level of ARGT resistance in the following year’s progeny.